Does composite flow make loop? Two guys gave a very wonderful explanation on this thread. I understand the concept of the Composite flow, but how does it work on the websocket client. It is a websocket client, that send a message to the websocket server and the printSink receives it and print it out. How can it be, that printSink receives messages, there is no a connection between the Sink and Source. Is it like a loop? 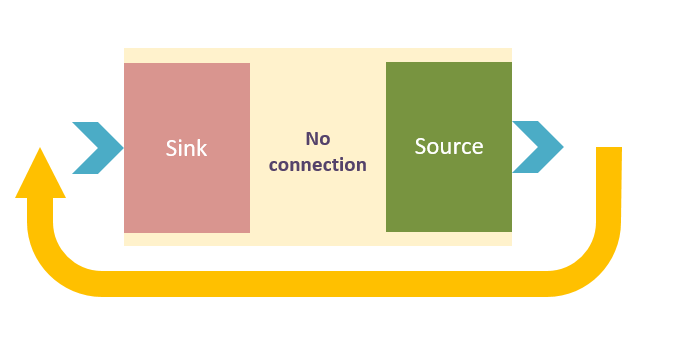 Stream flow is from left to right, how it comes that the Sink can consume messages from websocket server? Flow.fromSinkAndSourceMat puts an independent Sink and a Source to a shape of the Flow. Elements going into that Sink do not end up at the Source. From the Websocket client API perspective, it needs a Source from which requests will be sent to the server and a Sink that it will send the responses to. The singleWebSocketRequest could take a Source and a Sink separately, but that would be a bit more verbose API. Not the answer you're looking for? Browse other questions tagged scala akka akka-stream or ask your own question. What is the purpose of the composite flow(from Sink and Source)? How to clean up akka-http websocket resources following disconnection and then retry? How to subscribe websockets to actor's messages using Akka Streams and Akka HTTP? BroadcastHub filtering based on “resource” the connected client is working on? Failures in streaming handling of requests - what happens to connection?